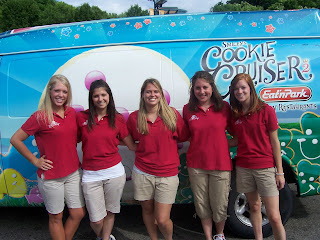 Now Hiring: 2011 Team Smiley Summer Interns at Eat'n Park! "What does Team Smiley do?" When asked what Team Smiley interns do for the summer, I can come up with an answer pretty quickly; they act as Eat’n Park’s brand ambassadors in the community. I know this, because for the 2009 summer, that was me. When asked what my time on Team Smiley taught me, I have a much harder time summing it up. See, Team Smiley is about much more than smiling sugar cookies, community festivals, a sweet ride, sock tans, and paychecks (though those are all really nice). Plus, Team Smiley has a lot of fun, and it shows. But believe me, there’s more than meets the eye. You learn to plan for events (as much as you can plan for an event!) and when that doesn’t work, you learn to go with the flow and be flexible. Nothing can stop us (including weather) from handing out those iconic cookies and getting to know our guests. All it takes is watching one kid decorate their own cookie (lots of icing, of course!) and take a big bite to understand why we love our jobs. It’s probably pretty safe to say that any high school or college student has once been a part of a team. But it’s probably also safe to assume that the team wasn’t together for almost 40 hours a week. When you spend that much time together, you quickly learn each other’s strengths and weaknesses and, as a team, how to use them to your advantage. That’s not to say we always did the same thing – every day our role was different. We shared the work and we shared the responsibility. I know most internships don’t offer that. Looking back, I remember walking into my Team Smiley interview a nervous, absurdly over-energetic college student looking for a paying job that didn’t require getting people to sign up for credit cards. But after my summer with Smiley’s Cookie Cruiser, I learned how to work with new people, plan for the unexpected, use my “inside voice” in a corporate setting, and positively engage in dialogue with guests. And boy, did that come in handy! Upon graduating from the University of Pittsburgh last May, I accepted the position of Community Marketing Assistant for Eat’n Park. I now have the honor of overseeing the program that taught me so much. My passion for Eat’n Park is as strong as ever and I’m still overly energetic, but now, I’m a professional in the making. Think you have what it takes to be on Team Smiley? Apply here. And maybe I'll see you this summer! Save on Eat'n Park takeout during the big game: two coupons! You'll be plenty busy getting ready for the game, so let us help! Pick up lunch or an early dinner to go (most of our locations are closing at 4:00 PM on game day), or grab a quart of homemade chili, chicken noodle soup, or our famous potato soup to enjoy during the game! You'll save time and money with Eat'n Park takeout - especially with our special coupons, valid on Sunday, February 6 only. Go Steelers! Click the link below to save our wallpaper as your desktop background, or to download and print our 8.5x11" poster! Click here to get our desktop wallpaper! Here we go, Steelers, here we go! Steeler Nation is behind you - just take it from these fans! 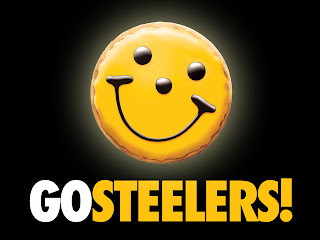 Steelers Smiley Cookie Gift Packs - Free shipping, anywhere in the U.S! The Steelers are headed to the big game in Dallas, and Steeler Nation is behind them! Steeler fans are spread far and wide across the country, and that's why we're offering FREE Shipping on the Steelers Gift Packs in our online store at SmileyCookie.com. Send a taste of victory anywhere in the U.S., and we'll pick up the shipping cost! We have three Steelers gift packs available. All are $25.99 and ship for free to any state in the U.S. Click here to place your order today at SmileyCookie.com! Order by Tuesday, February 1 for guaranteed delivery before the game. And if you're here in Pittsburgh, remember to swing by your local Eat'n Park to pick up a dozen Steelers Smiley Cookies and a quart of soup or chili to go! Save 20% on Eat'n Park takeout for the game this Sunday! Let us do the cooking on Sunday so you can focus on the big game! Use this coupon to take 20% off your Eat'n Park takeout order, Sunday only! Click here to print your coupon. Coupon valid on Sunday, January 23, 2011 only. Send our Steelers Playoff Gift Packs (with Steelers Smiley Cookies) to fans in enemy territory - free shipping! We're one home victory away from the big game, so here we go Steelers! We know that Steeler Nation extends far beyond Pittsburgh's city limits - that's why we're offering a couple special deals this week in our online store at SmileyCookie.com! You can send our Steelers Playoffs Gift Pack or our Rivalry Gift Pack to fans trapped in enemy territory, and we'll pick up the shipping cost. That's right - FREE SHIPPING on these two items when you send them to New York, New Jersey, or Connecticut this week via FedEx Ground. Place your order today at SmileyCookie.com! And if you're here in Pittsburgh, remember to swing by your local Eat'n Park to pick up a dozen Steelers Smiley Cookies for the game on Sunday. Healthy meals (and a little indulgence! ): TWO Eat'n Park coupons! 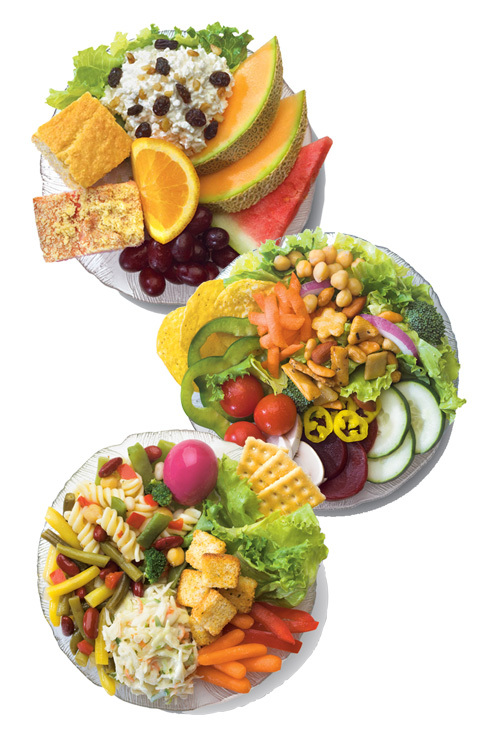 We know - you overdid it with the cookies and candy during December, so you're looking for light and healthy options to get back on track. That's where our Eat'n Smart menu comes in. Items like our Baked Lemon Sole, Rosemary Chicken, and Sesame Pork Chop are delicious AND healthy. Don't believe us? Try them for yourself, and take $2 off these items with this coupon - click here to print yours! Coupon expires Sunday, January 30, 2011. Of course, everyone deserves a little treat now and then. So print out this coupon and indulge in a free hot chocolate with your next meal - on the house! Enjoy! Let us do the cooking so you can focus on the game! Use this coupon to take 20% off any takeout order at Eat'n Park on Saturday, January 15, 2011 only! Coffee is one of those beverages that you either love or hate. I had my first coffee experience when I was 18 floating around the Atlantic Ocean in the Navy. I couldn’t stand coffee at first, but over time, I grew quite fond of it. 4:30 AM comes mighty quick, and coffee was the one thing that I could look forward to every morning. Regardless of where or when you had your first cup of joe, coffee has become an important part of many peoples’ morning rituals. Because our coffee is such a customer favorite at Eat’n Park, we wanted to be able to tell our guests where and how our coffee is grown. Our coffee comes from Costa Rica and Guatemala, both established coffee-growing regions. The company we source our beans from has been in business since 1967. They have well-defined standards in regards to planting, growing, harvesting and employee well being. 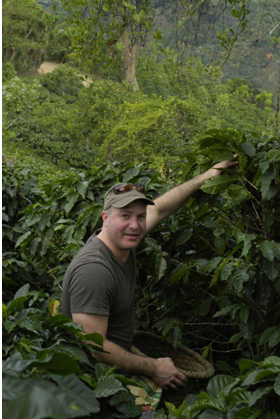 In February 2010, I had the pleasure of visiting one of their plantations, Hacienda La Minita in Costa Rica. My primary focus on this trip was to become more knowledgeable about where our coffee is sourced. La Minita is located about 1½ hours drive south of San Jose, in the coffee producing area called “Los Santos.” The plantation consists of a total of 1,200 acres of land, of which 680 acres are currently in production. In any given year, La Minita harvests from approximately 2,500 trees per acre on the farm, depending upon the geography of the area being planted and the variety of tree used. This results in a total of about 1,700,000 trees on the farm. As the trees age, older trees are gradually replaced with new trees from the farm’s nursery. In a typical year, about 150,000 new trees are transplanted from the nursery. The growing season begins with the first rains of the year, which normally occur sometime between the end of March and the beginning of May. The timing of the first rain is essential, for it is the rain that signals the tree to begin flowering. Approximately ten days after the initial rains, small honeysuckle-like flowers form on the trees. The flowering is of critical importance to the coffee crop, for the node where each flower formed will produce a single coffee cherry, and within this cherry are the coffee seeds which will become the coffee bean. 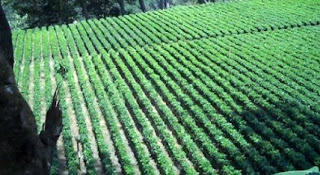 If the flowering is adversely affected by the weather, pollination wil not occur, no cherry will form, and there will be no coffee. From the onset of the initial rains, they enter into seven month of rainy season, when the farm sees four to six hours of rainfall every day. With the end of the rainy season comes the ripening of the coffee cherries. The large green cherries begin to turn either red or yellow as they gradually ripen. Because not all of the cherries ripen at once, most trees are picked up to 5 times to harvest all of the fruit. La Minita has a core of 80 full time employees, augmented by an additional labor force of about 600 people during harvest season. All of the farm’s full time employees are provided housing for themselves and their families on the plantation. The plantation assists their workers by actively supporting them in their lives outside of working hours. They contribute matching funds to the workers’ association savings plans. Additionally, a medical clinic is located on the farm near the administration building, and a doctor and dentist are on site several days a week to attend to the needs of the workers and their families. After seeing the source of our coffee firsthand, I was thoroughly impressed not only by the care taken to produce a superior-quality coffee, but also by the farm’s efforts to provide a safe, comfortable environment for their workforce. Though I was already a fan of the coffee we serve, my experience visiting La Minita gives me a whole new appreciation for it.